Hi. Julia here. 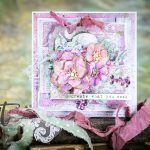 Today I’m sharing an elegant card made using a few of the gorgeous die sets from the Amazing Paper Grace Collection, designed by Becca Feeken. 1. Place the inner die only from the Swirl Striped Panel onto a piece of White Card, leaving a ½” border around 3 sides and 3” on one of the long sides. Run through the Platinum Machine using the cut sandwich. 2. die back into the right hand side of the die cut â it should just slide/fit into place and cut again. 3. Repeat Step 2 once more. 4. Nest 6 x 6 Matting Basics B Die #6 (the smallest size die is Die #1) and Die #8 together and secure repositionable tape. Then cut from White Card to create a frame. sure that all the curly cues are well stuck. Rub Crystal Glitter into the exposed adhesive. Add 3D Foam to the back of the die cut frame and add to the glittered background. Trim away the excess card. 6. Add a small piece of Double Sided Adhesive to a piece of Red Card and cut the Flower Small die from the Lacework Button Flowers Die Set. Remove the remaining carrier sheet and add Crystal Glitter. 7. Cut the Frame Small die from the Intertwined Spirals Die Set out of Red card. Cut the Frame Small die and the Small Insert 1 die together out of White Card. 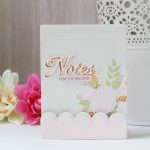 Cut the Circle Small die from the Lacework Button Flowers Die Set. 8. Cut the “Thank You” die from the Inviting Words Die Set out of Black Card. 9. Layer the die cuts up as shown adding some White Self Adhesive Pearls and insert the circle die cut into the flower die cut. 10. Tie a bow using 2 lengths of White Satin Ribbon and add the Lacework Button Flower with a Red Resin Flower in the centre. 11. Add a pierced layer of White Card 6¾ x 6¾”, a Red Card mat measuring 6⅞ x 6⅞” and another White Card mat measuring 7⅜ x 7⅜”. If you want a smaller card, use fewer mats. I do hope that this project has inspired you. Please leave your comments below – would love to hear from you. My name is Julia Watts, I have been papercrafting for over 10 years now. 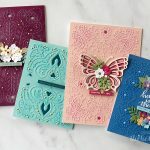 Over the past few years I have been demonstrating for Creative Expressions, both on the TV Shopping Channels and around the UK at Creative Expressions Stockists Shops.